Very nearly a year ago, I mentioned in a post on this very blog that I was hunting for ways to make my photography foot its own bill. I mentioned at the time that I was looking into stock photo sites like Photo Shelter, as well as online print houses such as MPix. 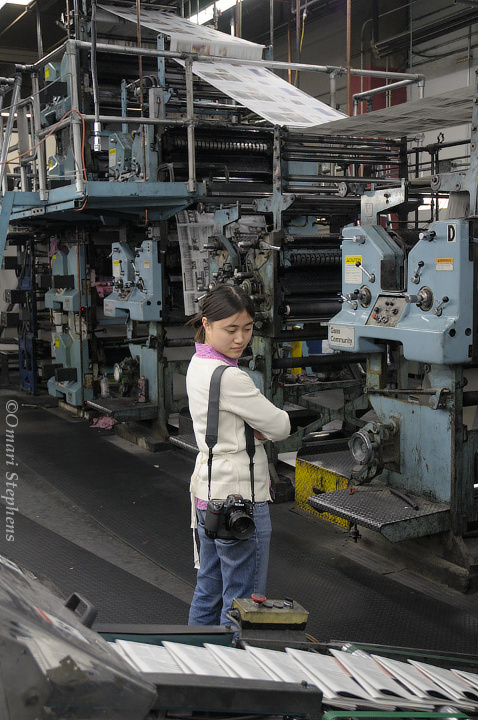 Quite fittingly, this printing press photo was one of the images that appeared in that post. In the time between then and now, I've done a lot of reading, a lot of research, and even some soul-searching. This past Sunday, I came up with a plan. Now, the plan is in action. So here's how this goes. The images are now links. If you like a photo, or if you want to see a bigger version, just click it. You end up at a place where you can see larger versions, get prints, or possibly just browse through the photos without having to jump from post to post. My other gallery will remain as a place to see photos in high volume. This new site will be a place to see them in high quality. To get a print, click the photo here, then look for the "Add to Cart" button in the top-right corner of the screen or in the pop-up menu of the image on that page. You'll then be able to pick paper size, quantity, finishing options (like mounting and framing), and all that jazz. Checkout is quick and easy; you don't have to get an account to buy things, and can pay with a credit card or PayPal. And to give you an idea, a few prices are $2/$4 for a 4x6, $6 for a 5x7, and $8 for an 8x10. I might end up changing things around a bit, though; feel free to complain. If you're interested in a photo I don't have up, just send me an email or leave a comment, and I'll do my best to have it up in the Requests gallery within 24 hours. I keep almost every photo I've ever taken, so feel free to ask about photos I may have shot for The Tech, or even before that. Also note that I've only gotten through the July and August blog photos so far. I'll be working to get through the rest of them in reverse chronological order throughout the next week or so. *Phew* It's been a long time coming. If you're interested, there are more details below. Either way, I really like this quote from Magnum photographer Elliott Erwitt, "I guess if you take a picture and you want to have a certain meaning, and people get that meaning, that's nice. Otherwise people can like my photos on any level and I'm happy." This is a photo of Graham Ramsay, an artist and a mentor to many, and one of my photographic mentors for a few years, now. 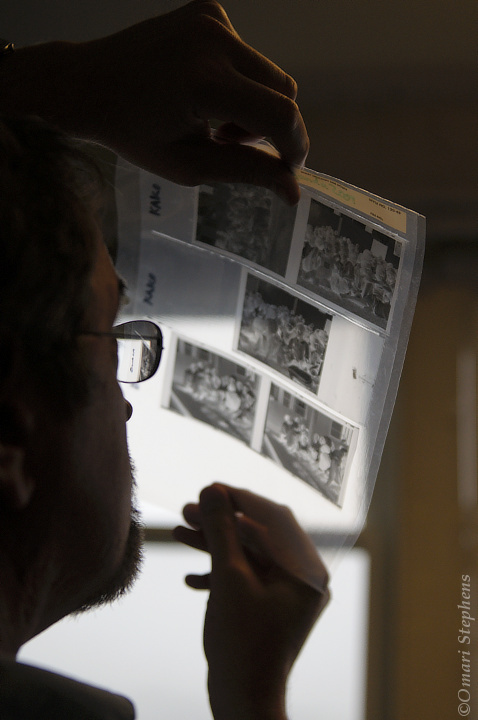 Here, he's looking through some medium-format negatives that a friend, Biyeun, had shot during her time in Uganda. Now, the gory details: As part of my research, I ordered around 40 prints from the MPix lab, including a couple 12"x18"s, on Thursday evening, 18 December. That's only a week before Christmas. MPix whipped through the prints on Friday and shipped them out that same day. I had the prints in hand Monday morning, with hours and hours to spare before I left the country that evening. So MPix is incredibly timely. Beyond that, the prints were stunning, and the packaging was fantastic. It was more than sufficient to give me confidence that anything I order will arrive in perfect shape, but also not so bulky as to be wasteful. Around the same time, I saw an email that MPix was teaming up with Zenfolio to provide a gallery solution for photographers. I failed to put two and two together and look into Zenfolio until a few weeks ago, which was a major oversight. When I finally looked, I was set to dismiss it when I saw this amazing waterdrop photo on their homepage. I looked to see if the photographer had other nice photos (he does), and the interface sort of grew on me. The site is super-slick, incredibly well-thought-out, and fast. It does what you need and gets out of your way. So this past Sunday, I started thinking that Zenfolio might be for me. I searched around a bit and all I could find were rave reviews, including one back from 2006. In addition to seeing that they were well-liked, it was also reassuring to learn that they've been in business for at least a couple years, now. That same night, I got an account, messed around a bit, and have been frantically processing and uploading large versions of the blog photos since then. There are a lot more nights of frenzied photo-editing ahead, but at least for this first milestone, the end is in sight.